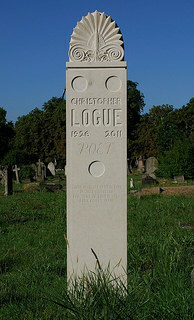 Christopher Logue is buried in Kensal Green Cemetery, London, England. His gravestone was designed by Gavin Stamp and carved by Stephen Lane from Portland Stone. 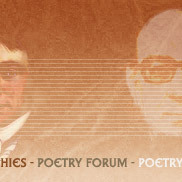 Logue was a poet, playwright, journalist and an actor. 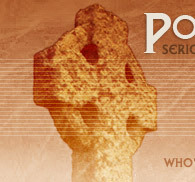 He was born in Portsmouth and studied at Portsmouth Grammar School. During WW2 he joined the Black Watch and he saw service in Palestine. He was court martialled in 1945 for selling stolen pay books and spent 16 months in an army jail. During the 1950s he lived in Paris and, togther wth his friend Alexander Trocchi, he edited the influential magazine Merlin - which published writers such as Beckett, Neruda and Genet. Logue was associated with the early years of the English Stage Company which staged a number of his plays. 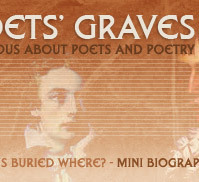 He was also a pioneer of Jazz Poetry - a music/poetry fusion originated by the US poet Vachel Lindsay. Logue was also an active anti-nuclear protestor and took part in the first Aldermaston march in 1958. 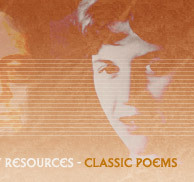 His poetry collections include: Wand and Quartet (1953), Songs (1959), New Numbers (1969) and Ode to the Dodo: Poems from 1953-1978. However, he is probably best remembered for War Music (1981) which was an adpatation of Homer's Iliad. It was a recreation of the Greek classic rather than a translation and was both visceral and violent. Louis MacNeice, who was himself a classical scholar, said of it that: 'never was blood bloodier or fate more fatal'.